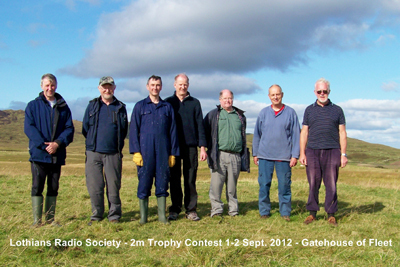 The GM3HAM Contest Group of the Lothians Radio Society took part in the RSGB 2m Trophy Contest on 1-2 September 2012 from our usual location in the hills above Gatehouse of Fleet. Conditions were nothing special but we made over 150 QSOs including a number on the continent - F, ON etc. See the full report with photographs. The Lothians Radio Society had a table at the annual Cockenzie & Port Seton ARC Mini Rally & Junk Sale, on Friday 10th August 2012. In addition to the PowerPoint show of LRS activities and display of leaflets, we also had members' items for sale on the table. Lothians members attending were Pete GM4BYF, Alan GM3PSP, Brian GM8BJF, Paul GM4UPN, Stewart GM4ZOA, Colin GM4HWO, Andy MM0FMF, Jack GM1CQC and Brian MM0WZB. Full report with photographs. 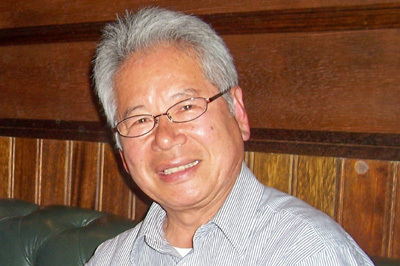 LRS member Vic Imamura JA5VQ / MM0JVQ (above) was the speaker at the first meeting of the new club year on 12th September 2012 at the Braid Hills Hotel. Vic gave a most interesting Powerpoint presentation on Amateur Radio in Japan. including the response of Japanese amateurs to the catastrophic earthquake & tsunami in March 2011. Click for Full Report. 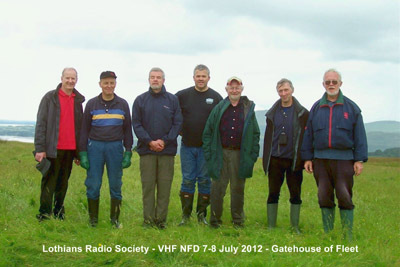 The GM3HAM Contest Group of the Lothians Radio Society operated in RSGB VHF NFD on 7th-8th July 2012 from our excellent site in the hills above Gatehouse of Fleet, looking out over the Solway Firth towards the Isle of Man. Unlike most of the rest of the country we had excellent weather apart from rain during Friday night and a brief shower while packing up on Sunday afternoon. Operation was on 6m, 4m, 2m and 70cm with very long yagi antennas. 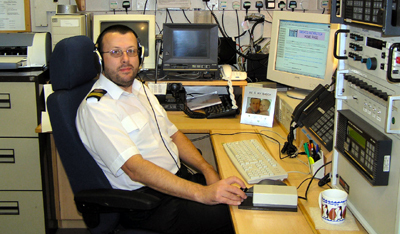 We were joined by guest operator Terry GM3WUX from Glasgow, who operated on 6m and 4m, mostly CW. Full report with many photos. Mike Gloistein GM0HCQ. Photo GM0HCQ website. 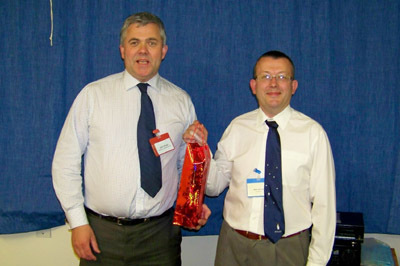 The official vote of thanks & gift presentation were made by MOC & LRS member Colin GM4HWO (L). It's Summer Break, but we have been enjoying our Summer Pub Nights! Vic & Alan didn't have exotic headgear like that worn by Peter & Melvyn at the last Pub Night on 22 Aug! 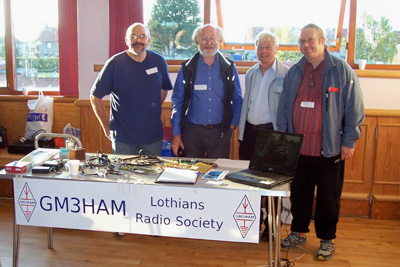 Formal meetings of the Lothians Radio Society will resume after the summer break on Wednesday 12th September 2012. In the meantime, we have been having our regular Summer Pub Nights on the normal club meeting dates of the 2nd & 4th Wednesdays at "wee" Bennet's Bar, Morningside. The first Pub Night on 11th July was attended by Alan GM3PSP, Vic JA5VQ, Pete GM4BYF, Tommy GM4DCL, Peter GM4DTH, Brian GM8BJF and Colin GM4HWO. The second Pub Night on 25th July was attended by Alan GM3PSP, Vic GM3OWU, Brian GM8BJF, Vic JA5VQ, Tommy GM1GEQ, Briain GM8PKL, Peter GM4DTH, Colin GM4HWO, Melvyn GM4HYR and Stuart MM3TZP. The third Pub Night on 8th August was attended by Alan GM3PSP, Vic JA5VQ, John GM8OTI, Brian GM8BJF, SWL Bruce, Peter GM4BYF, Briain GM8PKL and Peter GM4DTH. 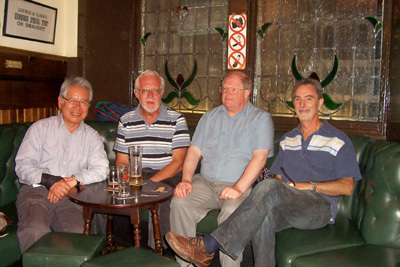 The fourth and final Pub Night on 22nd August was attended by Alan GM3PSP, Vic JA5VQ, Peter GM4DTH and Melvyn GM4HYR. Click for PHOTOS of all four Pub Nights. 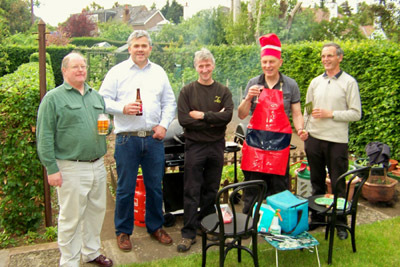 BBQ host Pete GM4BYF (in natty apron & hat) with some of the guests at the 2012 barbecue. The annual Lothians Radio Society Summer Barbecue was held on Wednesday 20th June 2012, once again graciously hosted by retiring LRS President Pete Bates GM4BYF and his XYL Kay GM6KAY at their home at Fairmilehead. Report with 16 photographs. The annual subscription will remain at £20. The full AGM report will be available soon.